Finally, the Battle of Aiken, South Carolina has gotten the full treatment it merits. For many years, as a child, I knew of the re-enactments of the Battle of Aiken, but for much of that time, I did not realize that it was a real battle. The attention it has gotten is so scant, that many others in the history community did not know this either. Only those with local interest willing to dig into scattered sources and gather the knowledge over a lifetime really knew. That now changes. This book covers the Battle of Aiken in great detail and places it in its full context within the Carolina’s Campaign. 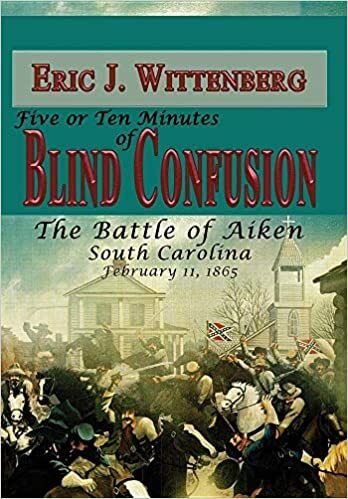 Using his normal level depth, Eric Wittenberg covers all phases of the days leading up to the clash at Aiken, the fight on February 11, 1865 and the outcome. This book is carefully indexed and has three appendices with difficult to obtain information. The appendices include an Order of Battle, Known Confederate Casualties and a discussion about the defense of Augusta, Georgia. This book is a welcome addition to the body of history about the Carolina’s Campaign. This entry was posted in Book Reviews and tagged Battle of Aiken. Bookmark the permalink.